The Austro Hungarians built wooden barracks where they kept their horses. After the horses died from contagious "sakagia" disease, the horses were not kept there anymore. Instead, during the World War One, the Austro-Hungarian army created the concentration camp in the area of ​​the present Doboj Railway station, and imprisoned Serbs were housed in wooden barracks where Austro-Hungarian Army horses were kept before they died. Memorial Complex, (church and ossuary) was built from 1931 to 1938, the dimensions of the church are as follows: 16.90 x 16.90 m. It was built in the Serbian-Byzantine style, and was finished in 1935 and the memorial ossuary with a monument was finished in 1938, when Mass graves were transferred, and the bones of Doboj prisoners and stored in the ossuary. 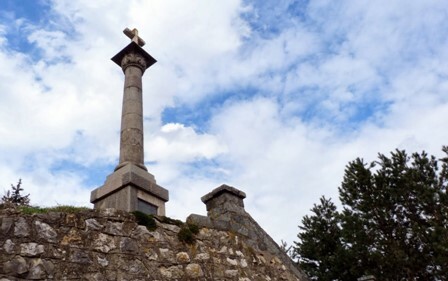 Above the ossuary monument, of Jablanic granite was erected. The memorial tomb is three-dimensional: height: 272, length: 8,30, width: 885 cm). Monument over the ossuary is magnificient, about 15 meters high. The dimensions of the church are as follows: 16.90 x 16.90 m.
This constructional/architectural World War One heritage does not exist and was the victim of industrialization, and were demolished in order to build the Doboj Railway station. However, the Memorial Monument for the victims of the camp is very well preserved. The Memorial complex: The church and the ossuary is under the protection of the former state under the Law on the Protection and Use of Cultural and Historical Heritage (Official Gazette of FR B&H No. 20/85), as a cultural and historical heritage of the second category, and today it is a memorial of republican importance for the Republic of Srpska. On December 27th 1915, the first group of Serbs arrived in the Austro-Hungarian camp Doboj, with about 600 older men, women and children from Gornje Podrinje municipality, Eastern Herzegovina and then Sarajevo-Romania county. In the camp, from 1915 to 1917, 45,791 Serbs were killed and, therefore, it can be said that several generations of numerous Serbian families - from grandparents to grandchildren have been wiped away. In commemoration of the victims of the Doboj camp, the Serbian Orthodox Church published a book "Monuments 1915-1917" in September 1938. 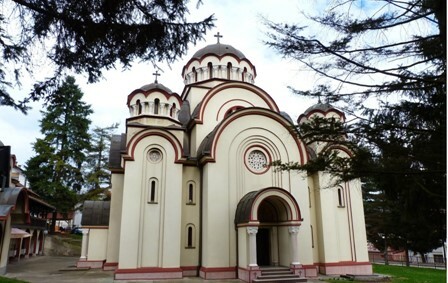 The idea of marking the remembrance of the Serb serviceman in the Doboj death camp was announced immediately after the end of the World War One, and the construction of the Memorial Complex began in 1931 at the initiative of the Serbian Orthodox Church Municipality in Doboj, when the Church provided land and money for Construction. After the outbreak of the World War Two, the whole complex suffered great devastation, and after the war, it was restored in accordance with the ideological and political conditions of the ruling system. Before the beginning of the last war in the previous state, the original symbolism of the 1938 memorial was restored. This constructional/architectural World War One heritage is owned by the Serbian Orthodox church and the local community. Doboj: (Memorial Complex and Monument, dedicated to the victims of the World War One, the Heroes Park, the memorial of the World War Two, ethno village Kotromanićevo) in Modriča, Medieval Fortress Doboj, medieval fortresses in Tešanj and Maglaj.